This impressive plant of the Bignoneaceae family has been decreed as Venezuela's emblematic tree species. 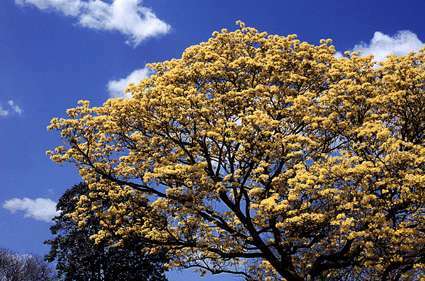 The name is of indigenous origin (Caribbean) and it describes several species of the Genus Tabebuia, among which chrisantha is taken as the emblem species. It is a tree of medium size whose trunk can grow straight or bent, in dry tropical forests, in the borders of savannas, in valleys or arid hills, up to an altitude of 1.200 meters. A massive yellow glowing bloom distinguishes it, after dropping away their leaves for the drought period. The tree develops a hard and compact wood, with a specific weight between 1,25 and 1,50, considered among the hardest growing in the American tropic. If a piece drops to the water, it sinks like a rock. This wood has been used for posts and also as sleepers for the rails of the railroads. Their mast bloom lasts for several days. All the individuals of the area produce flowers the same day, about four days after one of the scarce rains, which occur amid the drought. The massive bloom is quite attractive for the different bee species that pollinate them and for the hummingbirds and other birds that steal the nectar from their flowers. Nature - In this section of Venezuelatuya (Venezuela Yours), we proudly present short articles related to the country's nature. The author, Carlos Rivero Blanco, will show you the most interesting natural places, the plants, the animals, the birds of Venezuela.